Use the Lassco Wizer CR-177 Cornerounder is designed to handle up to a 1" stack of product. Designed with a long handle that has a 5" grip, the CR177 offers added leverage and comfort when punching either paper or plastic. It is incredibly simple to operate and the large throat helps to ensure maximum productivity. The CR-177 is now Improved with a new Alignment Guide for quick set up and adjustment. . The CR-177 includes one die and 1/4" and 3/8" blades, and comes with the new Cornerounder Right Angle Push Block, which makes rounding the corners on smaller product simple and easy. Includes one die and 1/4" and 3/8" blades. Welcome to MyBinding video. 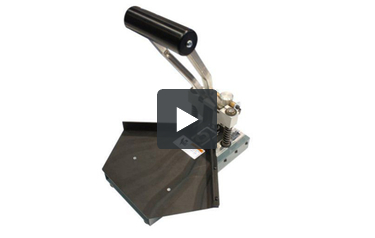 This video looks at the CR-177 corner cutter, a Lassco Wizer corner rounder. The CR-177 is sleek, easy to use, fully manual, and can handle up to a one-inch stack of product. It comes with a squaring block that's easily stored in the unit itself, two Allen wrenches for the adjustment of the die. The die cutting system is easily replaced as well as changed for different sizes. There are four suction cup feet on the bottom that keep your machine in place while in use. The lever handle is five inches in width and very comfortable to the hand, making repeated punching a breeze. The die is extremely sharp and very precise. Also included with the machine is a plastic base for the different size dies that are created for this machine. This goes underneath your project for the cleanest of cuts. Assembly and maintenance on the CR-177 is simple. Removal of this screw on the top allows you to slide in the lever handle, clamp it down tight. The screw goes back in and holds it in place nice and steady. The smaller Allen wrench is used for adjustment and centering of the fence for the table. That's it, that's the Lassco Wizer CR-177 Corner Rounder. For more demos, reviews, how-tos, and ideas, check out MyBinding.com.